﻿What ﻿does ﻿that ﻿mean ﻿to ﻿you? ﻿It ﻿means ﻿the ﻿greatest ﻿risk ﻿you ﻿face ﻿is ﻿reinfecting ﻿yourself ﻿by ﻿contacting ﻿clothes ﻿and ﻿sheets ﻿and ﻿towels ﻿you ﻿recently ﻿wore. ﻿Others ﻿will ﻿only ﻿catch ﻿it ﻿from ﻿you ﻿by ﻿extended ﻿skin ﻿contact ﻿or ﻿wearing ﻿or ﻿using ﻿cloth ﻿items ﻿you ﻿recently ﻿used. ﻿Here ﻿is ﻿the ﻿key ﻿thing ﻿to ﻿know: ﻿dry, ﻿high ﻿heat ﻿kills ﻿the ﻿mites ﻿and ﻿their ﻿eggs. ﻿But ﻿make ﻿sure ﻿the ﻿laundry ﻿is ﻿completely ﻿dry, ﻿because ﻿you ﻿are ﻿literally ﻿drying ﻿out ﻿the ﻿mites ﻿and ﻿their ﻿eggs ﻿to ﻿kill ﻿them. ﻿To ﻿kill ﻿all ﻿the ﻿mites ﻿and ﻿eggs ﻿that ﻿might ﻿be ﻿in ﻿your ﻿laundry, ﻿set ﻿the ﻿heat ﻿to ﻿high ﻿and ﻿the ﻿timer ﻿to ﻿at ﻿least ﻿30 ﻿minutes. ﻿Turn ﻿on ﻿the ﻿dryer ﻿and ﻿either ﻿let ﻿it ﻿run ﻿the ﻿complete ﻿time ﻿or ﻿you ﻿can ﻿take ﻿it ﻿out ﻿when ﻿20 ﻿minutes ﻿have ﻿elapsed. ﻿In ﻿a ﻿study, ﻿dry ﻿heat ﻿over ﻿122 ﻿degrees ﻿F ﻿(50 ﻿degrees ﻿C) ﻿for ﻿over ﻿10 ﻿minutes ﻿killed ﻿the ﻿mites ﻿and ﻿their ﻿eggs. ﻿Dryers ﻿get ﻿to ﻿150 ﻿degrees ﻿on ﻿high ﻿heat. ﻿The ﻿last ﻿10 ﻿minutes ﻿of ﻿a ﻿drying ﻿cycle ﻿is ﻿usually ﻿a ﻿cool ﻿down ﻿period, ﻿so ﻿I ﻿don't ﻿count ﻿that ﻿as ﻿high ﻿heat. ﻿That's ﻿why ﻿I ﻿say ﻿"at ﻿least ﻿30 ﻿minutes" ﻿on ﻿high ﻿heat. ﻿That ﻿will ﻿mean ﻿20 ﻿minutes ﻿on ﻿high ﻿heat ﻿and ﻿10 ﻿minutes ﻿of ﻿cool ﻿down. ﻿You ﻿can ﻿remove ﻿laundry ﻿after ﻿the ﻿first ﻿20 ﻿minutes ﻿if ﻿you ﻿are ﻿in ﻿a ﻿hurry. ﻿You ﻿can ﻿test ﻿your ﻿dryer’s ﻿temperature ﻿using ﻿a ﻿meat ﻿thermometer. ﻿Run ﻿some ﻿dry ﻿laundry ﻿on ﻿high ﻿heat ﻿to ﻿let ﻿the ﻿dryer ﻿heat ﻿up. ﻿Then ﻿put ﻿the ﻿temperature ﻿probe ﻿in ﻿among ﻿the ﻿hot ﻿clothes ﻿to ﻿see ﻿if ﻿it ﻿gets ﻿over ﻿122 ﻿degrees ﻿F ﻿(40 ﻿degrees ﻿C). ﻿One ﻿guy ﻿I ﻿corresponded ﻿with ﻿discovered ﻿his ﻿dryer ﻿wasn't ﻿getting ﻿hot ﻿enough. ﻿He ﻿probably ﻿could ﻿have ﻿just ﻿opened ﻿the ﻿back ﻿and ﻿cleaned ﻿out ﻿the ﻿lint ﻿to ﻿get ﻿it ﻿running ﻿better, ﻿but ﻿chose ﻿to ﻿buy ﻿a ﻿new ﻿dryer. ﻿Regardless, ﻿it's ﻿good ﻿to ﻿know ﻿if ﻿your ﻿dryer ﻿is ﻿killing ﻿the ﻿mites ﻿and ﻿eggs. ﻿Don't ﻿wash ﻿your ﻿laundry ﻿first. ﻿If ﻿you ﻿do ﻿you ﻿will ﻿have ﻿to ﻿completely ﻿dry ﻿your ﻿laundry ﻿and ﻿then ﻿run ﻿it ﻿on ﻿high ﻿heat ﻿for ﻿another ﻿30 ﻿minutes. ﻿It's ﻿best ﻿to ﻿put ﻿dry ﻿(dirty) ﻿laundry ﻿in ﻿the ﻿dryer ﻿first. ﻿After ﻿that ﻿you ﻿can ﻿wash ﻿it ﻿if ﻿you ﻿want ﻿to, ﻿but ﻿you ﻿don't ﻿have ﻿to. ﻿Just ﻿throw ﻿blankets, ﻿bed ﻿pad, ﻿towels, ﻿quilts ﻿and ﻿pillows ﻿in ﻿the ﻿dryer ﻿before ﻿reusing ﻿them. ﻿It ﻿would ﻿be ﻿crazy ﻿to ﻿be ﻿washing ﻿and ﻿drying ﻿those ﻿large ﻿things ﻿every ﻿day! ﻿Don't ﻿work ﻿any ﻿harder ﻿than ﻿you ﻿have ﻿to. ﻿Save ﻿your ﻿time ﻿and ﻿energy ﻿for ﻿doing ﻿the ﻿treatment ﻿program. ﻿In ﻿general, ﻿any ﻿mites ﻿or ﻿eggs ﻿on ﻿your ﻿clothing ﻿or ﻿sheets ﻿will ﻿die ﻿in ﻿2 ﻿days. ﻿Mites ﻿simply ﻿die ﻿if ﻿they ﻿are ﻿off ﻿a ﻿human ﻿for ﻿longer ﻿than ﻿a ﻿couple ﻿days. ﻿So ﻿if ﻿you ﻿simply ﻿leave ﻿clothes, ﻿towels ﻿and ﻿sheets ﻿in ﻿a ﻿drawer ﻿or ﻿on ﻿a ﻿shelf ﻿they ﻿will ﻿"self-decontaminate". ﻿There ﻿is ﻿no ﻿need ﻿to ﻿put ﻿things ﻿in ﻿bags. ﻿Mites ﻿can ﻿live ﻿longer ﻿than ﻿2 ﻿days ﻿in ﻿low ﻿temperatures ﻿and ﻿very ﻿high ﻿humidity, ﻿so ﻿to ﻿be ﻿on ﻿the ﻿safe ﻿side, ﻿leave ﻿unused ﻿clothing ﻿alone ﻿for ﻿4 ﻿to ﻿7 ﻿days. ﻿If ﻿you ﻿don’t ﻿want ﻿to ﻿wait ﻿a ﻿couple ﻿days ﻿to ﻿re-use ﻿an ﻿item, ﻿just ﻿treat ﻿it ﻿in ﻿the ﻿dryer. ﻿So ﻿it ﻿makes ﻿sense ﻿to ﻿select ﻿a ﻿few ﻿days' ﻿or ﻿a ﻿weeks' ﻿worth ﻿of ﻿clothes, ﻿sheets, ﻿etc ﻿to ﻿wear ﻿and ﻿use ﻿while ﻿doing ﻿the ﻿scabies ﻿treatment ﻿and ﻿put ﻿the ﻿rest ﻿aside ﻿until ﻿you ﻿are ﻿cured. ﻿No ﻿need ﻿to ﻿be ﻿laundering ﻿huge ﻿piles ﻿of ﻿stuff ﻿if ﻿you ﻿don't ﻿have ﻿to. ﻿NOTE: ﻿how ﻿to ﻿treat ﻿furniture ﻿with ﻿permethrin ﻿spray, ﻿where ﻿to ﻿get ﻿it, ﻿and ﻿DIY ﻿recipes ﻿follow ﻿after ﻿this ﻿list ﻿of ﻿the ﻿5 ﻿cures ﻿for ﻿scabies. ﻿Rugs ﻿and ﻿furniture ﻿are ﻿not ﻿usually ﻿infective ﻿with ﻿normal ﻿scabies. ﻿They ﻿rarely ﻿carry ﻿any ﻿scabies ﻿mites ﻿or ﻿eggs. ﻿You ﻿don't ﻿have ﻿to ﻿treat ﻿rugs ﻿or ﻿curtains ﻿or ﻿counters. ﻿Rugs ﻿and ﻿furniture ﻿are ﻿generally ﻿only ﻿infective ﻿in ﻿cases ﻿of ﻿crusted ﻿scabies. 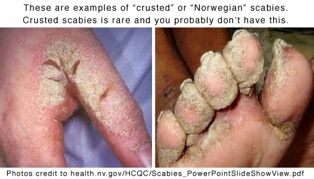 ﻿Look ﻿at ﻿the ﻿example ﻿photos ﻿below ﻿of ﻿crusted ﻿scabies. ﻿It ﻿is ﻿very ﻿rare ﻿and ﻿you ﻿probably ﻿don't ﻿have ﻿it. ﻿If ﻿you ﻿do ﻿have ﻿what ﻿look ﻿like ﻿crusted ﻿scabies, ﻿go ﻿to ﻿a ﻿hospital ﻿to ﻿be ﻿treated. ﻿In ﻿normal ﻿case ﻿of ﻿scabies ﻿one ﻿usually ﻿has ﻿5 ﻿to ﻿20 ﻿live ﻿mites. ﻿I ﻿know ﻿it ﻿feels ﻿like ﻿more ﻿than ﻿that, ﻿but ﻿all ﻿that ﻿itching ﻿is ﻿due ﻿to ﻿the ﻿allergic ﻿reaction ﻿from ﻿the ﻿mite's ﻿by ﻿products, ﻿not ﻿from ﻿the ﻿actual, ﻿live ﻿mites. ﻿Your ﻿immune ﻿system ﻿actually ﻿kills ﻿of ﻿most ﻿of ﻿the ﻿new ﻿mites ﻿that ﻿hatch. ﻿Those ﻿surviving ﻿mites ﻿"want" ﻿to ﻿stay ﻿on ﻿you ﻿because ﻿they'll ﻿die ﻿if ﻿they ﻿are ﻿off ﻿you ﻿a ﻿couple ﻿days. ﻿Your ﻿body ﻿is ﻿like ﻿a ﻿boat ﻿in ﻿the ﻿ocean. ﻿The ﻿mites ﻿only ﻿leave ﻿to ﻿transfer ﻿to ﻿another ﻿ship ﻿(some ﻿other ﻿human ﻿body). ﻿With ﻿crusted ﻿scabies ﻿the ﻿person ﻿has ﻿thousands ﻿of ﻿live ﻿mites. ﻿They ﻿literally ﻿ooze ﻿or ﻿drip ﻿mites ﻿all ﻿over ﻿and ﻿can ﻿the ﻿source ﻿of ﻿repeating ﻿scabies ﻿epidemics. ﻿Usually ﻿it ﻿is ﻿diabetics ﻿or ﻿others ﻿with ﻿severely ﻿impaired ﻿immune ﻿systems ﻿who ﻿develop ﻿crusted ﻿scabies. You can make your own, too. See the recipe on this page. You don't need to treat furniture, rugs or your bed with insecticides, but you can vacuum cloth furniture and rugs if it makes you feel calmer. Also you can make a 1/2% solution of permethrin and water and spray cloth furniture and car seats if it makes you feel better. I did that because I was truly paranoid. See the next section for instructions. Also I wanted to feel safer and be considerate of others, so I picked a chair to sit in when I watched TV or used my computer and put either a towel or a blanket over it. After I sat there, I tossed the blanket in the dryer for 30 minutes. Lots of people sat in my La-Z-Boy chair and no one ever caught scabies from me. Car seats are furniture in your car. They are unlikely to have any mites or eggs. You can purchase a permethrin spray intended specifically for clothing. Click here to buy pre-mixed Sawyer 1/2% permethrin spray at Amazon. You can also mix it up from concentrate (see recipe below). It's simple to use. You just spray it on the cloth until it is visibly wet. After spraying, I let it air dry before using the car or chair. Do this in the garage or the shade because sunlight degrades permethrin. It didn't stain or discolor my car seats, but test it on an inconspicuous area if you want to be sure. Remember, permethrin is very toxic to cats, fish and bees when it is wet. Once it is dry it is safe. But keep your cats away while you are spraying it around and until it dries. I mixed up my own spray solution by purchasing permethrin concentrate and adding water to dilute it to .5% (one-half percent) to spray on cloth furniture. I used both 10% and 36.8% concentrates. The 36.8% permethrin contains petroleum distillates (something like mineral spirits), so you will need to let things air dry outside for around 16 hours to dissipate the slight mineral spirits smell. I didn't notice any smell, but some folks are more sensitive. The 10% permethrin I bought contained no petroleum distillates so there is no mineral spirits" smell at all. You can look on the label (see samples, below) to see if it says "Contains petroleum distillates". To me, the "petroleum distillates" smells like mineral spirits, which can irritate skin. That's why you have to let it dry…to evaporate that out and not have it get on your skin or your pet's skin. Some folks are bothered by the smell, so open windows or do it outdoors. Petroleum distillates can really irritate one's skin, but once it has dried it's fine. Obviously the no petroleum type is better for anything that might contact your skin. ﻿To ﻿make ﻿1 ﻿half ﻿gallon ﻿(or ﻿2 ﻿liters) ﻿of ﻿0.5% ﻿solution. ﻿(Note: ﻿it ﻿may ﻿say ﻿"Permethrin ﻿SFR" ﻿on ﻿the ﻿bottle). 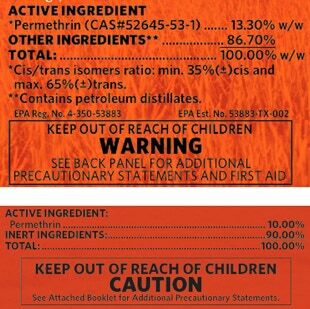 ﻿Obviously ﻿36.8% ﻿permethrin ﻿is ﻿more ﻿economical, ﻿but ﻿it ﻿does ﻿contains ﻿petroleum ﻿products ﻿(something ﻿like ﻿mineral ﻿spirits) ﻿so ﻿you ﻿don't ﻿want ﻿to ﻿apply ﻿this ﻿stuff ﻿directly ﻿to ﻿your ﻿skin. ﻿It ﻿costs ﻿3 ﻿times ﻿as ﻿much ﻿if ﻿you ﻿use ﻿10% ﻿permethrin ﻿concentrate, ﻿but ﻿it ﻿contains ﻿no ﻿petroleum ﻿distillates. ﻿Before ﻿you ﻿order ﻿AND ﻿when ﻿you ﻿get ﻿the ﻿permethrin ﻿concentrate, ﻿look ﻿at ﻿the ﻿label…if ﻿it ﻿contains ﻿petroleum ﻿distillates ﻿it ﻿should ﻿say ﻿so ﻿on ﻿the ﻿label. ﻿Early ﻿human ﻿experimentation ﻿indicated ﻿that ﻿fomites ﻿were ﻿not ﻿likely ﻿to ﻿contribute ﻿significantly ﻿to ﻿transmission, ﻿with ﻿only ﻿two ﻿cases ﻿of ﻿scabies ﻿recorded ﻿in ﻿volunteers ﻿from ﻿63 ﻿experiments ﻿involving ﻿exposure ﻿to ﻿the ﻿bedding ﻿or ﻿clothing ﻿of ﻿infected ﻿patients ﻿(Mellanby, ﻿1941). ﻿However, ﻿it ﻿was ﻿noted ﻿that ﻿blankets ﻿were ﻿considered ﻿by ﻿some ﻿at ﻿the ﻿time ﻿as ﻿the ﻿chief ﻿means ﻿of ﻿transmission, ﻿particularly ﻿in ﻿the ﻿Army ﻿(Mellanby, ﻿1941). ﻿Further ﻿human ﻿experimentation ﻿resulted ﻿in ﻿only ﻿four ﻿cases ﻿of ﻿scabies ﻿from ﻿272 ﻿volunteers ﻿who ﻿got ﻿into ﻿warm ﻿beds ﻿recently ﻿vacated ﻿by ﻿infested ﻿patients ﻿(Mellanby, ﻿1944). 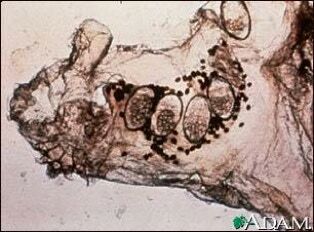 ﻿Scabies ﻿mites ﻿have ﻿greatest ﻿survival ﻿away ﻿from ﻿a ﻿host ﻿in ﻿conditions ﻿of ﻿low ﻿temperature ﻿and ﻿high ﻿relative ﻿humidity. ﻿Mites ﻿have ﻿been ﻿shown ﻿to ﻿remain ﻿infective ﻿after ﻿up ﻿to ﻿36 ﻿hours ﻿away ﻿from ﻿the ﻿host ﻿at ﻿22- ﻿24°C ﻿[72-75°F] ﻿and ﻿40-80% ﻿relative ﻿humidity, ﻿with ﻿the ﻿time ﻿taken ﻿for ﻿subsequent ﻿penetration ﻿into ﻿the ﻿skin ﻿as ﻿a ﻿function ﻿of ﻿the ﻿time ﻿off ﻿the ﻿host ﻿(Arlian ﻿et ﻿al., ﻿1984a, ﻿Arlian ﻿et ﻿al., ﻿1989). ﻿Female ﻿tritonymphs ﻿[note: ﻿tritonymphs ﻿are ﻿mature ﻿adults ﻿that ﻿can ﻿lay ﻿eggs ﻿— ﻿this ﻿takes ﻿about ﻿14 ﻿days ﻿after ﻿hatching] ﻿have ﻿been ﻿reported ﻿to ﻿survive ﻿as ﻿long ﻿as ﻿19 ﻿days ﻿at ﻿10°C ﻿[50°F] ﻿and ﻿97% ﻿relative ﻿humidity ﻿(Arlian ﻿et ﻿al., ﻿1989). ﻿This ﻿survival ﻿coupled ﻿with ﻿the ﻿recovery ﻿of ﻿live ﻿mites ﻿from ﻿the ﻿homes ﻿of ﻿scabies ﻿cases ﻿(Arlian ﻿et ﻿al., ﻿1988) ﻿indicates ﻿that ﻿fomites ﻿may ﻿have ﻿a ﻿role ﻿in ﻿transmission. ﻿It ﻿is ﻿likely ﻿that ﻿direct ﻿skin ﻿contact ﻿is ﻿the ﻿most ﻿important ﻿mode ﻿of ﻿transmission ﻿in ﻿cases ﻿of ﻿ordinary ﻿scabies, ﻿while ﻿fomites ﻿may ﻿also ﻿play ﻿a ﻿role ﻿in ﻿transmission ﻿from ﻿crusted ﻿scabies ﻿cases, ﻿in ﻿which ﻿extremely ﻿high ﻿numbers ﻿of ﻿mites ﻿are ﻿present ﻿(Section ﻿5.2.2)." ﻿1. ﻿Walker ﻿GJA, ﻿Johnstone ﻿PW. ﻿Interventions ﻿for ﻿treating ﻿scabies. ﻿Cochrane ﻿Database ﻿Syst ﻿Rev ﻿2000;(3): ﻿CD000320. ﻿(doi:.) ﻿doi: ﻿10.1002/14651858.CD000320.